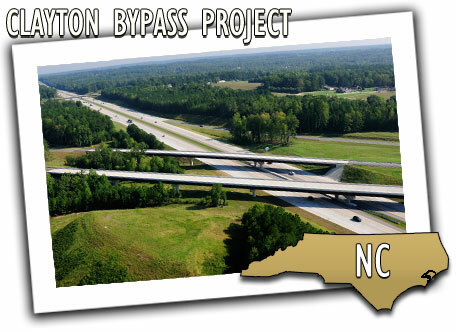 The Clayton Bypass is a new 10.7-mile, four-lane divided freeway from I-40 to US-70 in Johnston and Wake Counties. Constructed by the North Carolina Department of Transportation, the freeway included building 22 new bridges, and four new interchanges with major arteries, demolishing three existing bridges, and widening two miles of both eastbound and westbound I-40. Heavy traffic flows and multiple environmental concerns led to the use of numerous innovative techniques, intelligent transportation systems, and materials, including turbidity monitors, temporary work bridges, and the state’s first fully automated speed detection system. Speed sensors located throughout the project allowed dynamic message signs to display real-time travel information, including estimated drive times. The new bypass allows motorists to avoid 11 stoplights through town, saving between 15 to 30 minutes in travel time. It has also immediately eased workday commutes for 29,500 vehicles each day. The close working relationship among the contractors and NCDOT allowed this major project to be completed one year ahead of schedule, improving not only the traffic both through and around the town of Clayton, but also preserving important environmental areas in the Neuse River and Tar River Basins.